Formulated to support the ability to assimilate and 'digest' knowledge. The herbs in Study Power Tablets are combined in precise proportions and prepared in the traditional Ayurvedic way. This improves the bio-availability of vital nutrients. It also creates synergy -- the collective benefit is much greater than that of isolated, individual herbs. A fundamental theme of Ayurveda is to develop ones full mental potential. Maharishi AyurVeda has a treasure trove of 'Medhya Rasayanas' - herbs that provide powerful nourishment for the mind. Using these Medhya Rasayanas as a base, Maharishi AyurVeda Products has developed several safe and effective products to help enhance learning and memory. We offer balanced formulas for children, students and adults of all ages. Study Support Tablets (MA5724) helps enliven the ability to absorb, retain and utilize knowledge, formulated to support the ability to assimilate and 'digest' knowledge. 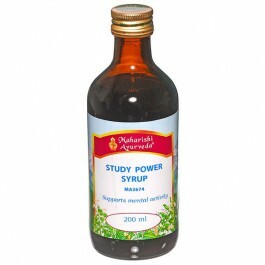 Study Power Syrup (MA3674) formula is ideal not just for children but students of all ages, because it helps enhance attention span, focus, and the ability to acquire new information and to apply it later. Rasayana for Children (MA230) is designed to give general support for the appetite and physical and mental development of children from about age three through to 15. Both of the super anti-oxidant formulas Maharishi Amrit Kalash Nectar (MA4 paste or MA7 ghee & sugar free tablets) and Ambrosia Amrit Kalash (MA5 tablets) are also recommended. The brain uses 20% of the body’s energy and in the process produces a lot of free radicals. Brain function is therefore sensitive to the efficiency of the body’s ability to mop up free radicals. These products are useful for people of all ages who use their minds at school or on the job, and want to feel fresh, creative, and fatigue-free. Mental performance can be expanded to its full potential. All it requires is going back to the basics -- proper nutrition, quality sleep and the balanced wisdom of herbs that can help nourish the mind in a natural, safe way. To nourish the brain, one should eat almonds, walnuts and sunflower seeds, milk, ghee and olive oil, and sweet juicy fruits. If you want to become more intelligent, eat more intelligent food. Intelligent food is fresh, organically grown, prepared with loving attention and contains Prana, or life. Unintelligent food includes junk food, fast food, canned, packaged and frozen foods and leftovers. Artificial colours, flavours and preservatives not only load the liver with toxins, but also weaken the immune system, and can lead to food allergies, or contribute to disorders such as Attention Deficit Disorder and Hyperactivity. This is especially true for teens, where adolescence is the time when children start building their adult bodies. Whether they become healthy, balanced individuals or weak, illness-prone people depend largely on what they are eating and doing now. Skip junk foods and switch to fresh, homemade meals. The whole family will enjoy the health benefits. Mental performance can be expanded to its full potential. 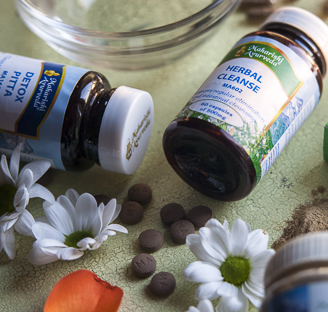 All it requires is going back to the basics -- proper nutrition, quality sleep and the balanced wisdom of herbs that can help nourish the mind in a natural, safe way. 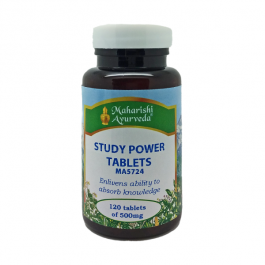 Maharishi AyurVeda Study Power Tablets have been developed as a safe and effective product to help enliven the ability to absorb knowledge. Take 2 tablets twice daily with water.